Inspired by 40 years of breastmilk research. 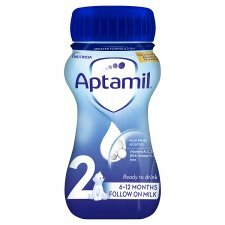 Aptamil® Follow On Milk is only for babies over 6 months, as part of a mixed diet. It should not be used as a breastmilk substitute before 6 months. The decision to start weaning including the use of this product before 6 months should be made only on the advice of a doctor, midwife, health visitor, public health nurse, dietitian, pharmacist, or other professional responsible for maternal and child care, based on baby's individual needs. When bottle feeding do not allow prolonged or frequent contact of milk feeds with your baby's teeth as this increases the risk of tooth decay. Ask your healthcare professional or dentist for advice Make sure your baby's teeth are cleaned after the last feed at night. After 6 months, once weaning is established, we recommend giving your baby about 1 pint (500-600ml) per day. 3. Aptamil® Follow On Milk can be given at room temperature or warmed if desired. If warmed, check temperature of feed. 1. For hygiene reasons, discard unfinished milk in the feeding beaker as soon as possible, and always within 2 hours. 2. Any unused milk in this 200ml bottle can be stored by replacing the cap, storing upright in a refrigerator and used within 24 hours. 3. Store unopened bottles in a cool, dry place.